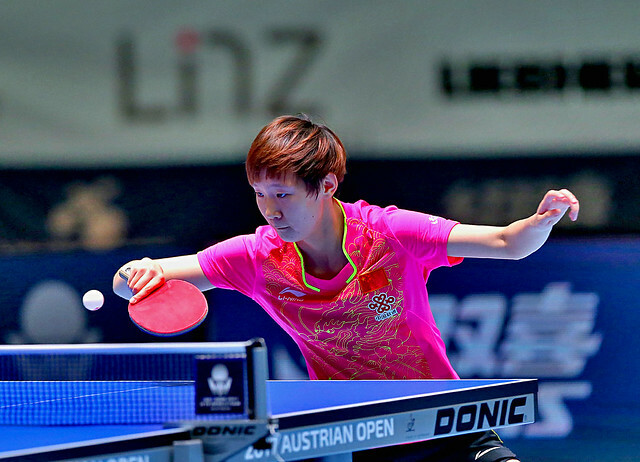 First place in the group stage of proceedings in the qualification tournament that precedes the Seamaster 2017 ITTF World Tour Platinum, Hybiome Austrian Open in Linz; when matters concluded on the opening day of play, Tuesday 19th September, four players had reserved top spot in their respective groups. Germany’s Ricardo Walther, Belgium’s Florent Lambiet and Japan’s Masaki Takami alongside Hong Kong’s Li Hon Ming could all reflect on a successful day. Ricardo Walther beat Frenchman, Joe Seyfried (10-12, 11-5, 9-11, 11-8, 11-5, 14-12) prior to receiving a walk-over when due to face Austria’s Andreas Levenko. Similarly, Florent Lambiet, after accounting for Japan’s Shunsuke Togami (11-8, 7-11, 13-15, 9-11, 13-11, 11-6, 11-5) was not required to raise his racket in anger when due to face Frenchman Tristan Flore; a situation that also applied to Li Hong Ming. He accounted for the Czech Republic’s Michel Obeslo (8-11, 11-9, 11-9, , 7-11, 13-11, 11-6) prior to being awarded a walk-over when scheduled to face Austria’s Chen Weixing. However, somewhat differently, Masaki Takami, like Shunsuke Togami from Japan, secured first place the hard way; he caused two upsets. Listed at no.291 on the current Men’s World Rankings, he beat Hungary’s Daniel Kosiba, named at no.192 (11-5, 11-7, 11-5, 11-8) before cementing top spot by overcoming Hong Kong’s Jiang Tianyi, ranked no.56 (12-10, 11-3, 11-6, 11-9). A surprise defeat for Jiang Tianyi, there was also a surprise defeat for Germany’s Steffen Mengel but unlike Jiang Tianyi, first place in the group is still an option. Standing at no.64 on the current Men’s World Rankings, he was beaten in seven games by Japan’s Yuta Tanaka, listed at no.347 (11-7, 12-10, 11-8, 2-11, 5-11, 9-11, 11-3). However, also in seven games in the opening match in the group Yuta Tanaka had lost to the Czech Republic’s Pavel Sirecek, listed at no.162 (13-11, 11-9, 8-11, 13-11, 3-11, 8-11, 11-9). Steffen Mengel now needs to beat Yuta Tanaka is six games or better to secure top spot in the group; a seven games win and points ratio will be needed. Nervous moments ahead for Steffen Mengel, for colleague, Bastian Steger who is the second highest rated player on duty in the Men’s Singles qualification tournament, it was one match played, one win. He beat Chinese Taipei’s Lee Chia-Sheng (11-8, 11-8, 11-8, 11-8). Likewise, amongst the leading names on first day duty, it was a successful start for the Chinese duo of Lin Gaoyuan and Liang Jingkun as it was for Denmark’s Jonathan Groth.